These dried "muscles" become chewy when wet and provide a natural way to clean teeth and exercise gums. As these are a natural product, thickness varies slightly from stick to stick. 100% digestible and highly palatable dogs generally prefer them over basic rawhide. It should take at least 30 minutes for your dog to consume this chew. If he/she is eating it faster you are recommended to try a different chew item for your dog. As with all chews remove pieces that are small enough to be swallowed and choked on. 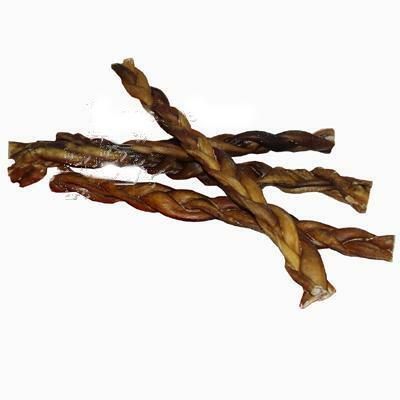 Bully Sticks are also referred to as "Bullies", "Bull Sticks", "Pizzles" and "Beef Chews". Bully Sticks are 100% Bull penises.